Now unlike my Christmas decorations which take up several large boxes in the loft, my Easter decorations are a much smaller affair....so small in fact that they seem to have got completely lost in the mass of stuff stored in the roof. However, a couple of weeks ago my mum gave me these lovely duck egg blue speckled egg decorations which I love. 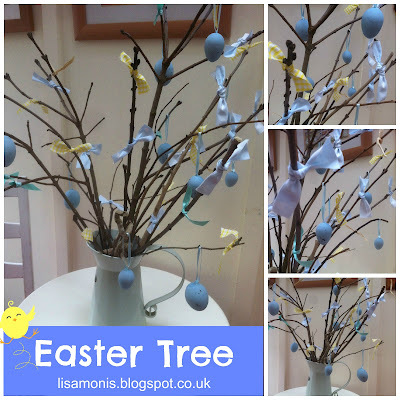 Yesterday I set about making my Easter Tree but the eggs alone left the tree looking rather sparse so I raided my fabric stash and found some perfect yellow gingham and light blue cotton with tiny hearts on it. A few roughly cut strips and natty knots and my Easter Tree was complete.